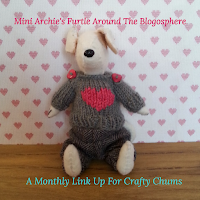 Archie the wonder dog: Catching Up With Myself...Again! 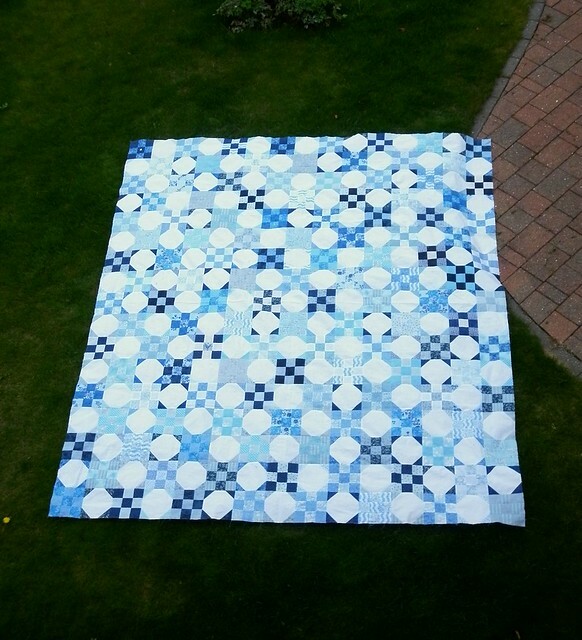 First up is 'that bl**dy blue and white quilt' (that's what it's called in my head but I'll have to think of a better name for it, if only because it's for Mam and she'll tell me off for swearing!). This project was my main focus for the last quarter and, I'm pleased to say, I finally have a finished quilt top! It's so big that the only way to get photo of all of it at once is to put it on Mam's front garden and take a photo out of the front bedroom window! She wasn't very impressed, particularly when I told her she had to stay out there while I went to take the photo!! Sorry, it's a horrible photo and the back fabric is much nicer in real life! 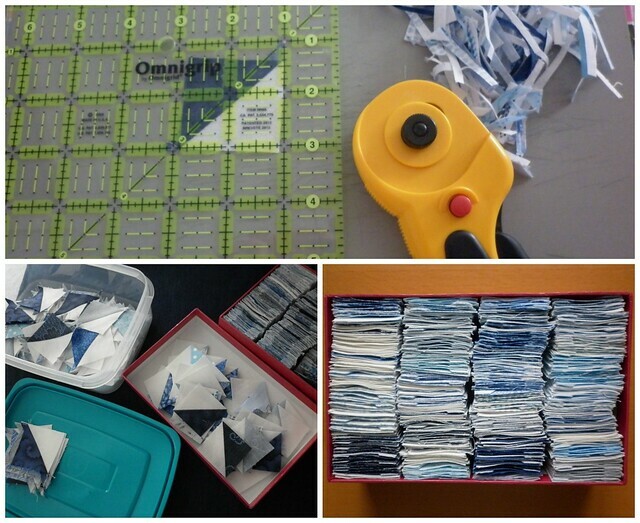 I spent a few mind-numbing evenings pressing and trimming the little bonus HSTs from the blue and white quilt. There are 508 of them and they now measure 1.5" square (so they'll be 1" finished) and they're going to become two cushions to go with the quilt. I have a little cutting board (about 12" x 8") which I put on a hardback book so I can trim while sitting on the settee watching telly - the only way I can get through trimming lots of blocks is in front of the telly so heaven help me if I ever have to trim lots of blocks which won't fit on my little board! I had a nice system going - I'd take ten out at a time and put them on the plastic box lid, transfer them to another lid when they were trimmed and then, once that was full, transfer them to their final destination: yet another box! I couldn't resist the glittery button for the centre, and not just because it was the only suitable one in my button box! 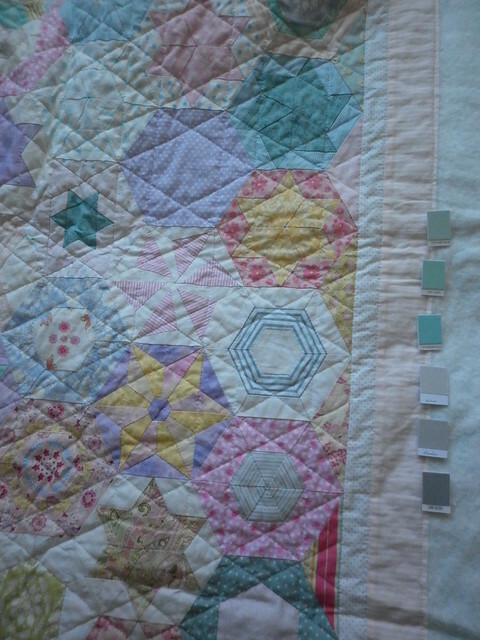 I chose the binding fabric for my hexy quilt - it was well worth pulling apart my Kona colour card! I pulled out all the colours which I thought would work with both the top and the back. I've gone for the second one from the bottom, Kona Shadow. I've heard tell of something called 'supper' - do I get that? I've been making progress on some items on my Q4 FAL list, with a couple of (woolly) finishes already - I'll be back to share them soon sometime soonish. Love the blue quilt top, very reminiscent of blue willow and other blue china! Poor Archie! I often think dogs are a lot more sensitive than we even begin to imagine, especially tummies and skin. Love the blue and white quilt but seeing all that trimming of HST's makes me think maybe I shouldn't have bothered creating bonus hsts when I did my latest quilt top because I'll never have your order and stamina for all that fiddly cutting! Archie does not look pleased! I love how dogs have such expressive faces. Love the blue and white quilt (delft?) - well done on the finish! Bloody blue and white is bloody gorgeous! 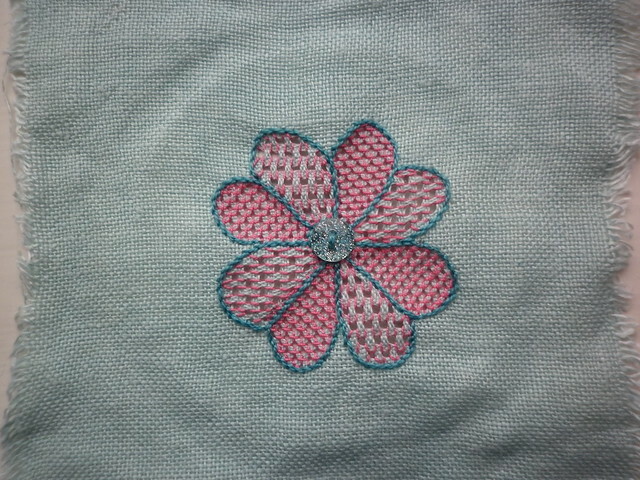 Hooray it's b****y well finished at last ! So happy for you and sad for poor little Archie! Jan is wearing one of your knitted cowls on IG! It looks brilliant and is also blue! I'm loving the bl%%dy quilt, nine patch and snowballs? 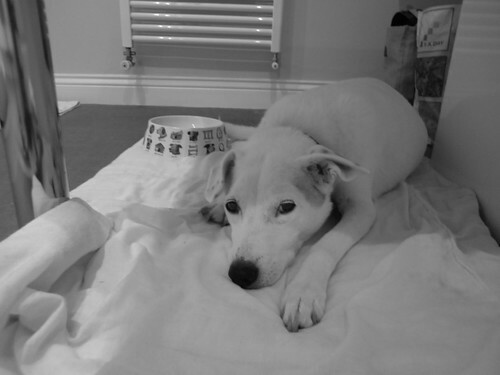 Sorry to hear A didn't get on with the biscuits, poor thing! You're very patient doing all those HSTs - gosh they are small! Love the quilt you made for your mother. The snowball - 9 Patch combo is one of my favorite traditional patterns. Your blue version is really lovely. 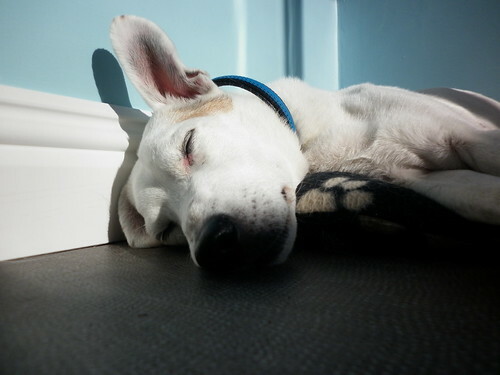 Archie is so handsome...I hope he feels better soon! 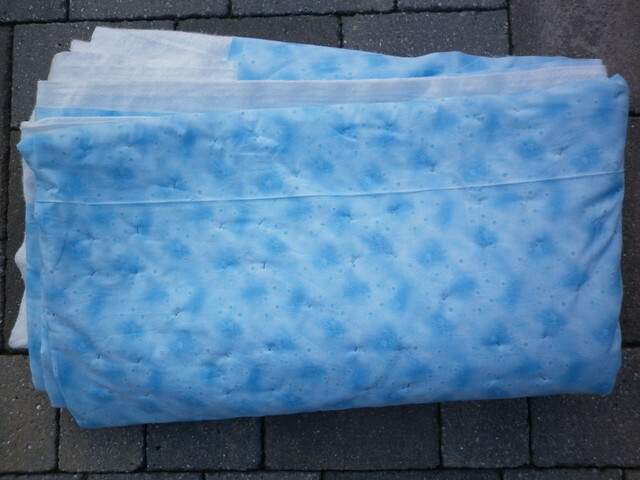 The blue and white quilt is lovely, well worth all your efforts. Thank you! I'm afraid that Google+ hasn't attached your email to your profile either, so I can't reply to you via email. I do hope that you stumble across this reply at some point! Oh . . . Musical HST's .. "you put your left side in, you put your left triangle out, you put your wiggly side in, and trim it all about . . you do the hokey pokey . . and you turn it around....."
. . . . and there's Archie! 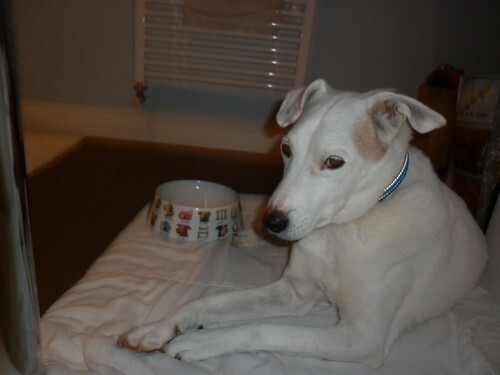 "No Biscuits Archie" . .. poor wee boy. Taunting his tummy like that. Are you sure your Mam wants that Bl%%dy quilt. Send it to the colonies! I've been in awe as its come together. The quilting will give an even softer dimension. So gorgeous. Clever Helen. What a feat. Put up your feet.